DRAGNET GIRL is a stunningly beautiful Ozu silent — rich b&w tones, crisp compositions, beautifully modelled lighting on faces, and a subtly soft-focus glaze over everything. I made the mistake of watching it while thick with the cold, which meant following the simple plot was a challenge, but the imagery washed over me like a crashing wave of beauty. Being a relatively early Ozu, I guess, this one doesn’t have any of the characters look directly into the lens, but Ozu still has an idiosyncratic approach to eyelines, sometimes preferring to jump the line so he can frame each character in a conversation to match the other exactly, rather than mirror-reversing them as is common in the western shot-reverse-shot pattern. Since Ozu is incredibly adept at this kind of thing, it’s never confusing. But it’s good to see he already loves a good still life, although in this film they’re a lot less still — he introduces the office setting with a shot of the clock, then tracks past a row of hats on hooks, one of which symbolically drops to the floor as we reach it. Then he does a matching track past a row of typists, ending on the criminally-inclined Kinuyo Tanaka, a gangster’s moll who’s romancing the boss’s idiot son. It’s accurate enough to call these “establishing shots” in a way, but they also have a structural function — when Ozu repeats them at the end, when Tanaka and her b.f. heist the place, we not only know where we are but we sense the story is near its conclusion. Elsewhere, Ozu pirouettes around his objects, either elegantly with a slow track, or in finger-snapping jumps with his editing — the Victor Records shop where good girl Sumiko Mizukubo works is dotted with H.M.V. 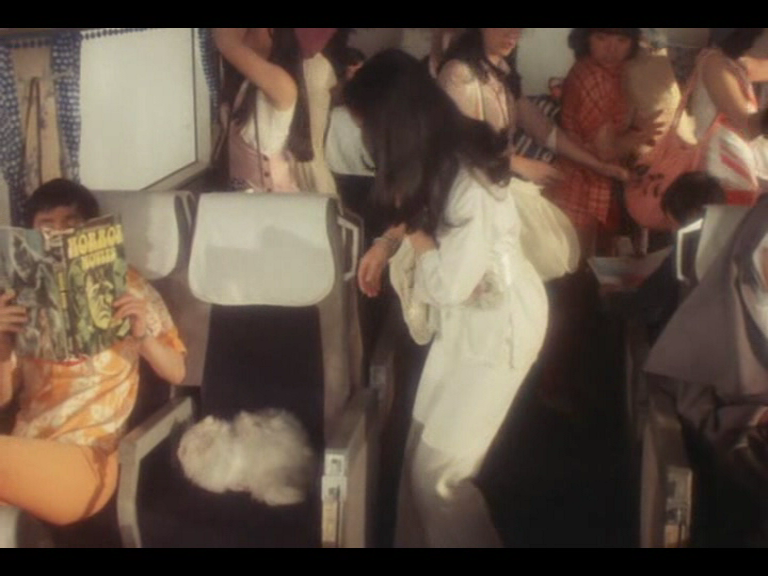 dogs, and Ozu seems to be playing at cramming at least one dog into every shot. This kind of formal playfulness does seem to be very much Ozu’s bag, and has emerged as a much more productive avenue to explore than all that “transcendental style” nonsense Paul Schrader put about back in the day. Thanks to David Bordwell for clearing the air, I think. Meanwhile, he often freezes his actors, so that they adopt rigid stances like props themselves, crackling with pent-up emotion, activated when the camera position jumps around them just as it did with the inanimate objects. The Japanese love of Von Sternberg, the use of the word DRAGNET in the title, and the crime-movie genre all led me to expect some kind of Ozu-Sternberg fusion, but the Josef Von influence isn’t too obvious. Ozu throws in a homage to another 30s filmmaker by featuring a French poster for ALL QUIET ON THE WESTERN FRONT, and those tracking shots of hats and typists do actually relate in a way to the much fast tracking shots of trench warfare in Lewis Milestone’s epic. In each case the movement makes the shot about a large number of things (hats, dying soldiers) rather than a single subject, but the movement causes us to view them in a sequential fashion, so that we see how the large number is made up of individual examples. Leading man Joji Oka is extremely handsome, and allows Ozu to celebrate his love of booze (in my experience, the Japanese are constitutionally well-suited to massive alcohol indulgence — as my friend Kiyo said, “I don’t really get drunk. I saw Shuju drink a bottle of vodka one night, and he was… quite good.”). Kurosawa favourite Koji Mitsui plays the good girl’s brother, who wants to be a bigshot gangster like Joji. 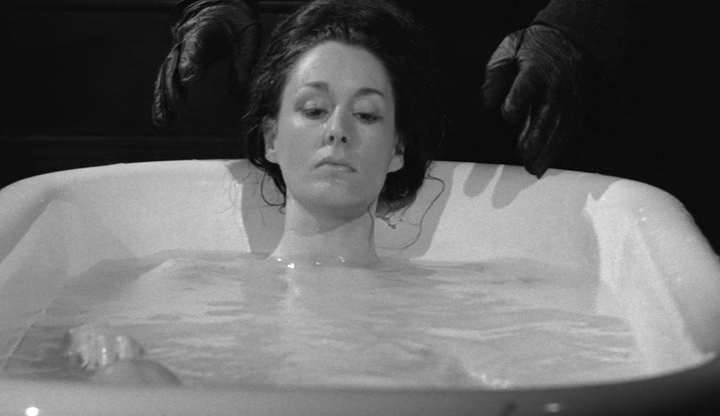 Like I say, the plot is very simple, but it barely penetrated the big wad of imploded mucus that was my head. I was introduced to Ozu with the usual nonsense about the camera always being at the height of a kneeling person, and all that hooey. And there was a good bit of talk about the camera staying behind when people leave the room. Here, Ozu withholds a clear view of the action on only a couple of occasions. There’s a terrific fight, played only on the reactions of Joji’s gang, as he single-handedly defeats his rivals. And then there’s a bit of surprising girl-on-girl action — the jealous Tanaka confronts the innocent Mizukubo, intending to shoot her, but decides she likes the girl. What throws a lot of strangeness and dramatic weight onto the kiss that follows is that Ozu cuts to pavement level, showing Mizukubo’s feet in the foreground, and Tanaka’s feet rushing abruptly towards them, then retreating. Then we cut to the startled Mizukubo putting her hand to her cheek. I mean, we only intuit that a kiss has occurred, with the onscreen information available, it COULD have been a slap. But it felt like a kiss.